This 2 car garage and shop is an excellent example of one of our more popular building designs. After reviewing options with our PermaBilt® Building Representative, a Tukwila Washington couple chose this beautiful building as the one they had to have! The picture tells the story. 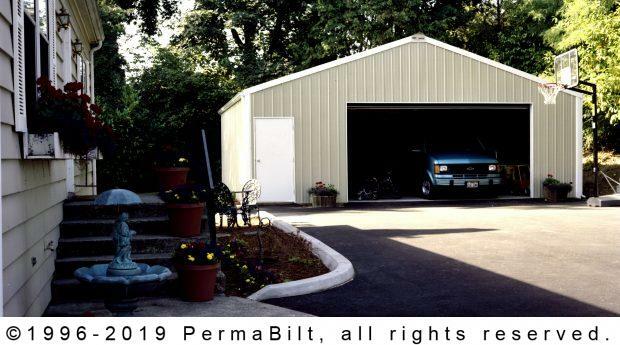 The post frame garage and shop measures 28’ x 28’ x 9’ and the size and color complements their nearby home. For access to his vehicles and shop the design includes a 16’ x8’ raised panel steel overhead door. The building also has (2) 3’ x 6’8” PermaBilt® walk-in doors which include polyurethane foam core, reducing sound and possessing superior insulation. Upon completion of the garage and shop the owners were anxious to park their vehicles and toys under secured cover as well as getting started on some set aside projects in their new shop. That is after moving the b-ball hoop as to not interfere with that left baseline jumper!